Euro Bus Expo 2008 held in Birmingham, England in November was somewhat misleading as nearly all the exhibits targeted the British market. The argument for hybrid buses in Europe grew strong last summer when the price of oil peaked at $147 per barrel. When Rocky Mountaineer Vacations shut down its Gray Line West operation in Vancouver, BC, Canada in 2007, the move created a significant void in sightseeing options for this area. Gray Line was the only large bus sightseeing operation in Vancouver and had been running for years. 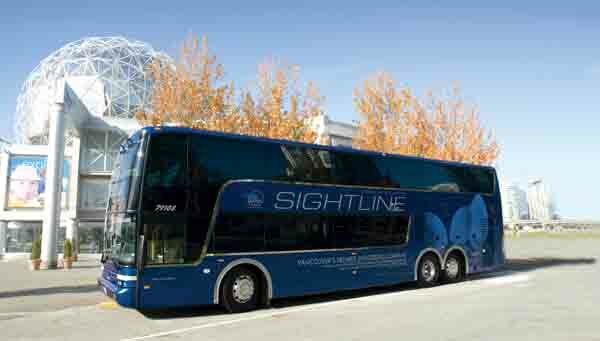 The motorcoach tour business is not recession-proof, but it is resilient in the face of today’s tough economy. Operators say the number of people booking motorcoach tours is down from last year and they attribute more last-minute cancellations and smaller group sizes to the downturn. But as people tighten their belts and purse strings, those who still wish to travel see motorcoaches as the most affordable option. Each fall the Great Wine Capitals Global Network presents its Best of Wine Tourism Awards to the most deserving hospitality leaders throughout San Francisco and Napa Valley. Wine tourism services is one of the seven competitive categories, sustainable wine tourism practices is another. Longtime industry partners Peter Pan Bus Lines and Greyhound put their heads together to come up with a more inviting a more professional and much safer curbside bus service. While the Chinatown buses cruised the northeast corridor over the last several years, longtime industry partners Peter Pan Bus Lines and Greyhound put their heads together to come up with a more inviting solution. The two carriers determined with what was going on there was room in the market for a more professional and much safer bus ride. Ronald Bast stepped up to accept the 2008 BUSRide Motorcoach Industry Achievement Award on behalf of his family’s company, Riteway Bus Service, Richfield, WI. This annual award honors the motorcoach owner-operator who demonstrates excellence and innovation throughout the business. As the next re-authorization of the Highway Bill approaches, rising fuel costs and environmental concerns have propelled public transit into the spotlight, and give agencies that struggled in 2008 to balance inflated gas prices with record ridership levels a compelling case to argue for increased funding from a new Federal administration.